Stockholm, Sweden - Net Insight, the leading provider in media transport and resource scheduling, today announced that the STCC Live App, built upon Sye, a True Live OTT streaming solution, was awarded the IBC 2017 Best of Show Award, presented by NewBay's TV Tech Global. The STCC Live app, used in conjunction with the STCC (Scandinavian Touring Car Championship) races, leveraged Net Insight's Sye technology to deliver ultra-low latency synchronized video feeds to OTT devices. The STCC Live app offered viewers a complimentary, unique, and immersive experience, including real-time access to driver cams, driver information, the production feed and guest speakers. All powered by the Sye streaming solution. Because of the synchronization capabilities of Sye, second screen engagement applications have finally come of age. The Sye solution will facilitate the next generation of truly engaging companion apps such as STCC Live. For the first time, the STCC audience had the ability to follow the race in real-time on their iOS devices, becoming the producers of their own live experience. With Sye, the second screens can serve as an extension of the first to deliver the ultimate viewing experience. This opens up for new monetization possibilities such as: in app purchasing, voting, , polling, in-game betting, and server-side ad insertion, immune to ad blockers. "Winning the Best of Show award for the STCC Live app is further proof of how we are shaping the future of live OTT and how the next generation live events will be consumed and monetized," says Per Lindgren, senior vice president of Live OTT at Net Insight. "Syncing the first and second screen for live events is the missing link when it comes to creating shared, social live experiences." 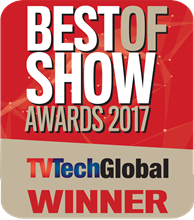 The Best of Show Award recognizes the most innovative products and services exhibited during IBC 2017. Winners were selected from more than 1.500 exhibitors at IBC 2017 hosted at RAI Amsterdam.